SKU: Walking Stick with 2 handles. Enjoy the freedom to go wherever you want with this foldable cane that makes for easy travel. This walking stick gives you the stability and support that you may need. Its extra-wide base at the end of the stick is pivoting, this works well on irregular surfaces and gives you added security. This Magic Cane stands by itself if you let it go! LED lighting on the handle allows you time to take a walk in the dark, as it illuminates the path and so tripping and falling down can be avoided. 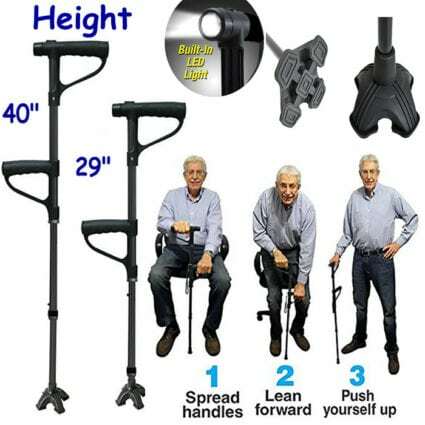 The walking stick is adjustable to 5 heights. Maximum weight limit is 250lbs. Consult a physician or healthcare advisor prior to using any assisted mobility device. Foldable for easy travel, stands on its own! Lift Assist 2nd pivoting handle with useful storage! Built in LED lights, extra wide pivoting base, soft grip handle, incl.